We are currently in the process of updating our team photo and staffing profiles. The staff pictured above have been with us many years now; this photo was captured back in 2013 so we are long overdue for an update. As you may know we have some newer members to our team and coordinating everyone and a photographer on every ones nice hair day isn’t easy. On a much more serious note; we have employed the very best staff who are experts in their area. Without this complete control, the risks include long delays blaming third parties for the cause and not receiving what you are asking for because of a ‘Chinese whispers’ effect. You can avoid unnecessary costs from outsourced consultants! At Signature Homes Geelong we have total control for the entire journey. Gary employees our team of specialists’, all located at 126 Fyans Street to help you, offering assurance as we guide you through the process with honesty and integrity. Gary Watts: Gary is the sole director and registered Builder for Signature Homes. Gary commenced trading under Signature Homes Branding in 2005 and has an excellent reputation as a high quality builder of both order and custom homes in the Geelong District. Gilda Watts: Having worked with Signature Homes since the company began Gilda has managed the administration and accounts of the business overseeing all operations around her since day one. With the expansion of the company Gilda has broadened her department and continues to provide her expertise maintaining the company’s administration. Bianca Watts: After successfully completing year 12 in 2007; Bianca joined the business in early 2008 and completed a certificate 4 in Business Administration during the year. Bianca’s involvement in the business includes; marketing and OH&S management. After many years of being around the family business; Bianca is highly knowledgeable of administration processes and completes colour selections for our clients. Simon Mc Clure: Simon has a wealth of experience as a new home construction consultant. He is a local with a strong commitment to customer service. Simon is passionate about real estate and has a comprehensive understanding of new home designs and identifying the needs of potential purchases. He has the ability of turning your dreams into reality. Mick Stanley: Having Bachelor of Construction Management and vast experience in project management with many large developments in the Melbourne area. Mick’s role as Manager ensures our team provide our clients with exceptional service. 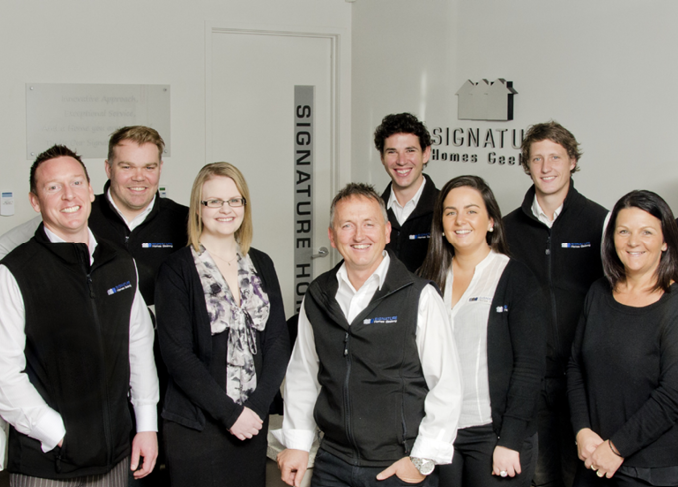 Mick is committed to driving the ongoing success of Signature Homes Geelong. Dean Trembath: Having Bachelor of Construction Management, fulfilling the Estimator role. Dean has a sound knowledge in planning, costing, tendering and negotiating. Dean maintains exceptional relationships with our suppliers and onsite trades. Briody Cole: Briody is a valuable member of the team who is dedicated to delivering exceptional customer service, from when our clients walk in the door or call us. Briody is passionate about Signature Homes product range. that's our signature promise "